Spray 4 1/2-quart slow cooker with baking spray with flour. 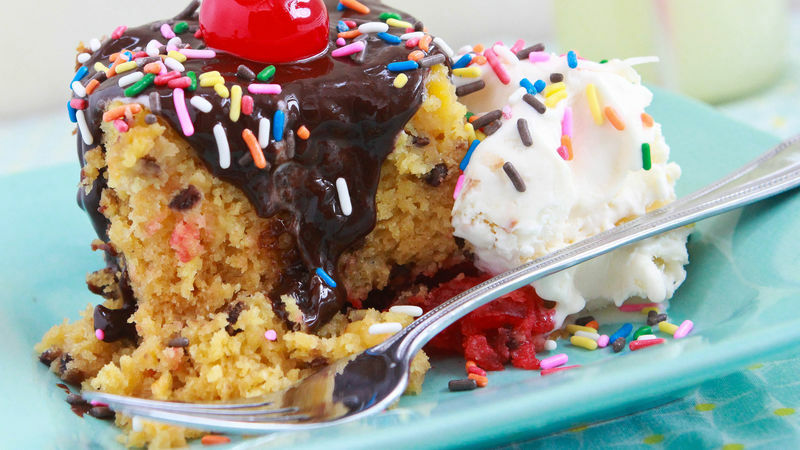 In large bowl, stir together cake mix, melted ice cream, water, oil, eggs and pudding mix. Cut 12 of the maraschino cherries in half, and fold into batter along with 1/4 cup of the pecan pieces. Pour batter into slow cooker. Top with remaining pecans and 8 more maraschino cherry halves. Cover; cook on High heat setting 2 to 3 hours or until cake is set in center. To serve, spoon hot cake from slow cooker, and top with scoops of ice cream. Drizzle with hot fudge; top with remaining cherries. Since slow cookers often cook differently, the first time you cook a cake in the slow cooker may take some trial and error to find the right amount of time to cook the cake to doneness. Start gently lifting the cover at about 2 hours, pressing the center of the cake lightly with your finger. If it doesn't spring back to the touch, replace the cover, and check every 15 minutes until done. For extra banana flavor and moistness in this cake, omit the water and add 2 very ripe, pureed bananas to the batter.